Both Japan and India are currently bracing for weekend impacts from major tropical storms. Super typhoon Vongfong is expected to impact southern Japan from Saturday, followed by tropical cyclone Hudhud which will impact India’s west coast shortly after. 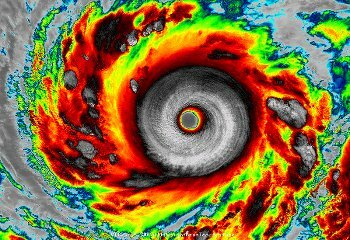 First, super typhoon Vongfong, the most intense storm to form anywhere on earth in 2014, which peaked in intensity on Tuesday with maximum sustained winds of 180mph, gusts of up to 220mph and minimum central pressure of around 900mb. Vongfong has since weakened slightly, to now carry sustained winds of 155mph and gusts of 190mph. Further weakening is forecast as Vongfong approaches Japan’s southern Ryukyu islands, but the typhoon is expected to still be a Category 2 equivalent, at least, when it reaches there. After striking the Ryukyu islands, the forecast track shows typhoon Vongfong moving north-eastward along the Japanese archipelago, gradually weakening but still at Category 1 equivalent when it impacts Kyushu. This means impacts for much of Japan with strong potentially damaging winds possible and torrential rainfall and flooding a certainty on that path. Typhoon Vongfong comes just one week after typhoon Phanfone, which drenched Japan with high levels of rainfall and passed over Tokyo itself. Vongfong’s path along Japan will affect much of the same areas as Phanfone. As a result the rainfall induced flood threat from Vongfong will be much greater, given the saturated state of much of Japan following the last typhoon. As ever with a threat of catastrophe in Japan, should typhoon Vongfong maintain its strength for longer and result in significant structural damage, or should flooding be particularly severe, there is a risk to the reinsurance, insurance-linked securities (ILS) and catastrophe bond market, making this another storm to keep track of. Now, onto tropical cyclone Hudhud, an altogether rarer beast as a strong tropical storm with sustained winds of 70mph and gusts of 85mph in the Bay of Bengall. Cyclone Hudhud is forecast to intensify strongly as it tracks across extremely warm waters, ideal for fueling storm growth and strength, resulting in an expectation that Hudhud could be a strong Category 3 equivalent when it makes landfall on India’s west coast with winds of over 111mph. The expectation is that Hudhud will become a severe cyclone in the next day and will then make landfall somewhere on the northern Andhra Pradesh coastline late on Saturday. Heavy rainfall and destructive winds are expected in the region where Hudhud makes landfall, with flooding and landslides also expected to be an issue. In India the lack of insurance penetration means that there is likely no real exposure for the ILS market and even reinsurers are unlikely to be hit badly by a storm like this. However the economic and social impact can be tragic, with some cyclones responsible for major loss of life and high economic losses. Evacuation is key and has in the past, such as with cyclone Phailin last year, saved many lives. Cyclone Hudhud will once again demonstrate the lack of insurance cover in emerging markets like India. Conversely, typhoon Vongfong may show up the lack of insurance penetration in Japan, which can result in lower than expected losses even for a highly developed nation. Both storms remind us of the fury of mother nature and the valuable role that risk transfer has to play. We will update you should the outlook worsen for Japan from typhoon Vongfong. The tracking maps above will update every few hours so you can bookmark or return to this page to see the latest outlook.